I am in the midst of a great existential crisis. Ha, just kidding! I just happen to have the urge to re-do every room in our house. I'm literally daydreaming of gutting bathrooms and changing out siding. However, my budget isn't exactly allowing for multiple massive projects at the moment, so I have to think small. I'm going room by room and trying to perfect them all and get rid of any pieces that I have held on to for no reason (and dislike!) My wish list is just growing by the second! I mean, look at this table (thanks Nat!) and these insane brass shelves! I'm all about getting more greens inside and this planter would be perfect for doing that. I also want more subtle storage solutions, like this Parsons book shelf which is actually meant for a child's room! I mean, how fabulous is that? I also swear my taste is going from majorly shabby chic to craving a lot more modern and midcentury modern. Big apologies to my poor husband - thank goodness he is an excellent mover of furniture! I bet you can guess what I will be doing when I'm done working today. Actually it's continuing to work on the play room, my first project! A trip to Ikea is definitely in order this week! Yup, I want one of each for my home!!! I love that Nate Berkus side table! I really like all his items at Target right now! 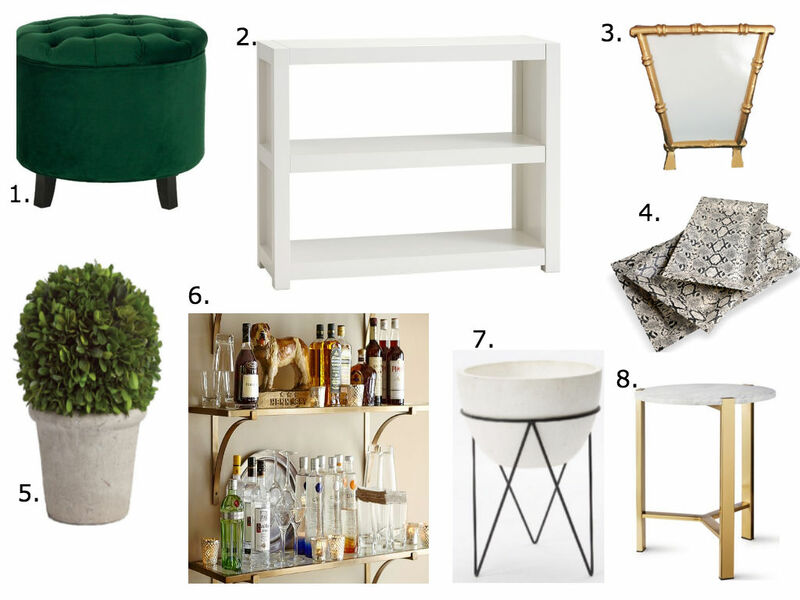 I feel like I'm constantly wanting to redo every room in our house too! It's never ending!! i love it all! home decor is one of my favorites- esp. that green ottoman! Love all of this! Greenery is my idea of adding color these days haha, that planter is so cute. Love it all!! I can totally relate. I'm trying to think small and not big but I'm driving my husband crazy with stuff I want to do with the house. I'm still trying to find a place for those side tables in my house. I love that parsons bookshelf too.